The following MINER sample application shows a Scenario that makes use of some MinerTools and illustrates several concepts of MINER with still being a simple application. The Scenario is then executed in a private testbed. The figure depicts the setup of the scenario. Between ToolProxies al40-202 and al40-201 delay, jitter, and loss are actively measured according to an IPPM standard. On ToolProxy al40-51, 2 different MinerTools are employed. The SnifferTool is used to capture network traffic on the interface that faces router R1. The libpcap-based tool produces a binary trace in pcap format as well as throughput data (in pkt/s) averaged over 1s intervals. Additionally, the NetemTool, which is based on the Linux NETEM functionality, is used to emulate delay. Finally, an SNMPTool is employed on ToolProxy al40-204. 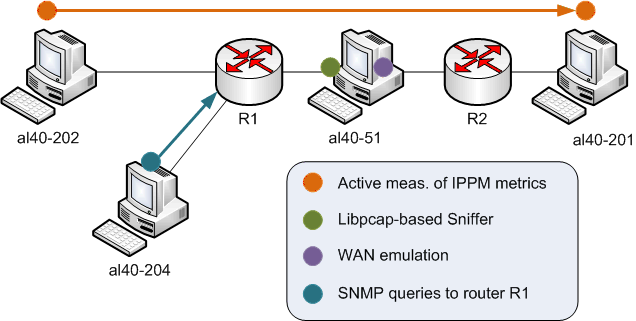 It periodically sends SNMP queries to router R1. The MINER Core is located on host al40-47 which is not shown in the figure. Below is a listing of the sample application. * (C) Salzburg Research Forschungsgesellschaft mbH. All rights reserved. // The Scenario specification is complete. // timestamp / value pairs. 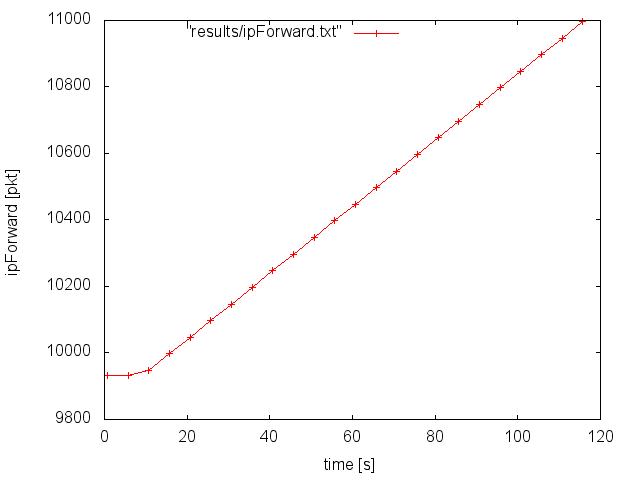 The result class lossRatio has a required configuration parameter interval: the time interval over which the average is computed. Additionally we set the optional configuration parameter lossThreshold: if a packet is received with a delay > lossThreshold it is considered as lost. As the IPPMTool results are exclusively produced at the receiver, we restrict the result query to the receiver ToolProxy. We define that the measured delay must be smaller than 95ms. As NETEM is configured to emulate a delay of 100ms between 60-90s of the experiment, we expect condition violation alarms in the Executionlog. To see some results during the execution, the tputPkt result is queried every 5 seconds. As we want to save those results to a file later on, we collect them (to avoid an additional query for all results after the execution has finished). After the execution has finished, we first get and print the executionlog. Note that the log contains the condition violations as expected. Then we make various uses of the Results class to demonstrate some of its capabilities. The binary pcap trace is retrieved and automatically saved to disk. Before proceeding, the directory for saving results is set. This directory is used in the subsequent save/getAndSave calls. The binary pcap trace is retrieved and saved automatically because binary results are always saved to disk. The tputPkt results that were collected during the execution are then saved to a file. Finally, the hOwdPcap, hLoss, and hIpForward results are retrieved and saved to individual files. Note that the savePatterns of hLoss and hIpForward are used. The result hRouterInfo is not loaded from the MINER Core in this scenario. The Executionlog contained the following output. 2011-09-01 14:29:04.0 WARN  Condition violation: subcondition 'owdPcap < 50000.0' violated by owdPcap value of '100303.0'. 2011-09-01 14:29:14.0 WARN  Condition violation: subcondition 'owdPcap < 50000.0' violated by owdPcap value of '100235.0'. 2011-09-01 14:29:25.0 WARN  Condition violation: subcondition 'owdPcap < 50000.0' violated by owdPcap value of '100285.0'. Note that the condition violations are reported as expected. The MINER Core was configured to report the violation of a Condition at most once every 10 seconds. 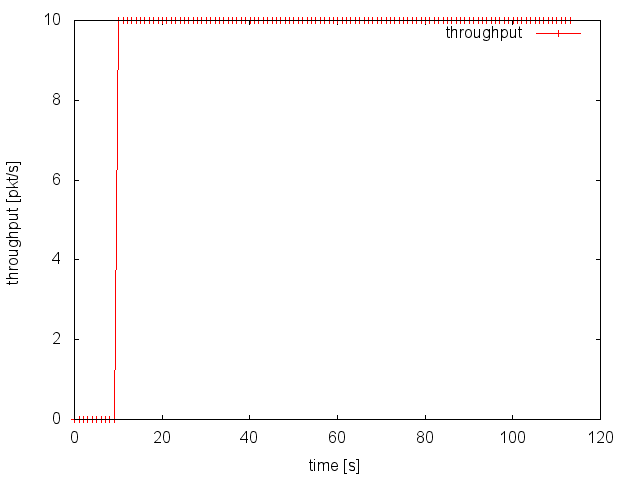 The following figure shows the throughput measured by the SnifferTool. 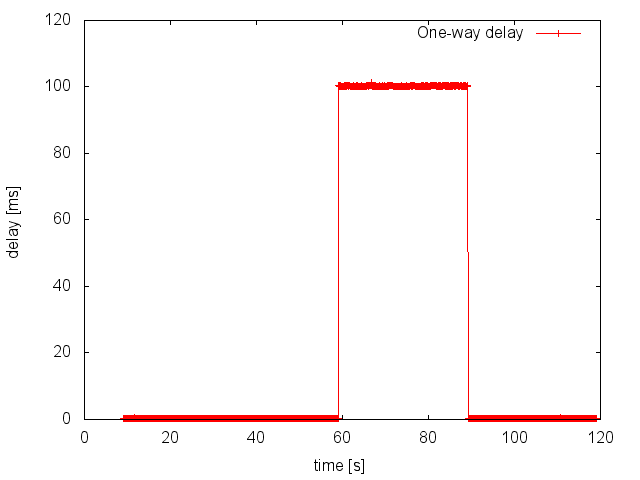 The following figure shows the one-way delay measured by the IPPMTool. Note that the delay is virtually 0 (all hosts are located in the same room) unless for the period between 60 and 90 seconds where the WAN emulator NETEM emulated a delay of 100ms. The following figure shows the IP forwarding numbers of the router R1. They were obtained by periodic SNMP queries of the router. 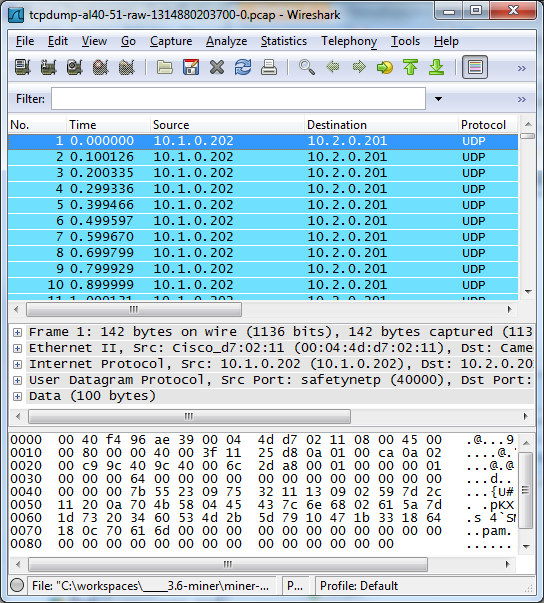 The following figure shows a screenshot where the binary pcap trace which was produced by the SnifferTool is loaded in wireshark.